tracieclaiborne.com: Caroline's first trip to the dentist. Caroline's first trip to the dentist. Today was Caroline's first trip to the Dentist. She had her teeth cleaned by this sweet lady whose name I failed to ask. I was happy to hear that Caroline doesn't have any cavities but she has a crossbite that will need to be corrected. We will be seeing an orthodontist soon for a consultation. The thought of them putting a brace in her mouth horrifies me. If she's scared, I'll be scared. If she's in pain, I'll be in pain. But I guess there's no use worrying about it right now. She did great at the Dentist's office. Of course she barely spoke to them. There was another homeschooled Kindergartener there at the same time which was surprising. I don't know them but they're in our White House Support Group. The brother had a shirt that said so. I thought that was highly coincidental. Anyway, I'm glad it's over. Next week is her five-year-old checkup with five shots. Oh the joys of being a Mother (and a kid!). Ah the joys! She looks brave tho. We had our first visit to the orthodontist earlier this month for Julian. Julian has too many teeth across the bottom...overachiever. Gets that from his dad. LOL! Anyway, the O said to come back once a year until he's 12. Then we'll start in on the braces. Joy. That's one of the cool things about HS. You can schedule appointments during tradionally "school hours" and not be totally wigged out over scheduling and missing school. Love that. Oh Sweet Caroline. Don't let the O. do anything drastic, while she is this young. She is still growing. Cody has a crossbite and has an appliance in his mouth. He did fine! We have a great orthodontist, but his offices are in Hermitage and Lebanon...don't know if you want to drive here, but he is wonderful. Dr. Benson. 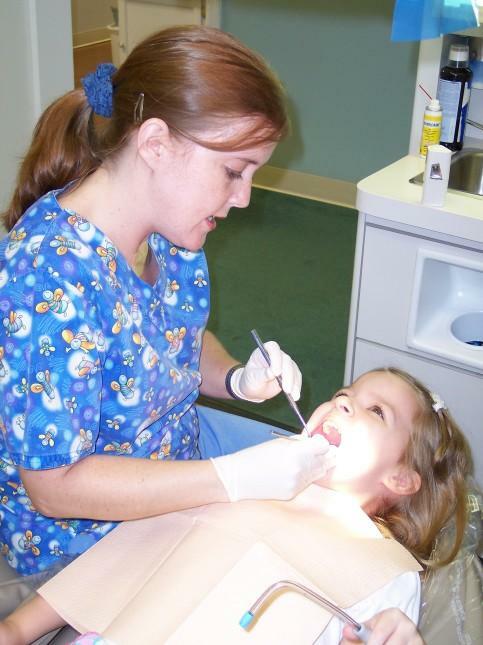 I'm so glad I got to see the picture of Caroline at the dentist. She is here with me now while I'm looking and reading. She sure was brave! I am just very happy for Caroline. Hoping that my son would also enjoy his first visit in a makati dentist nearby.